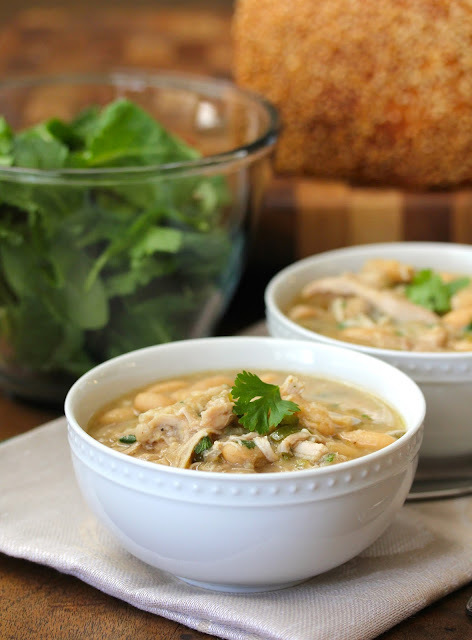 This slow cooker white bean and chicken chili was a huge hit in our house. What I love about its that the broth is thickened with hominy, which is pureed with broth. No cream, flour, or corn starch were (or is it "was") sacrificed to make this chili. While this is not your typical dump and go slow cooker recipe, the advance preparation is well worth it. The onions, jalapeños, garlic, cumin, and coriander are sautéed together before being added to the slow cooker, and then the sauté pan is deglazed with chicken broth to make sure you get all of the flavor bits from the bottom of the pan. The chicken in this chili is cooked bone in, and then shredded and added back into the dish. You can keep it warm in the slow cooker for a few hours, or you can make the whole thing in advance and reheat it the next day. It's perfect for game day. On the first day we garnished it with just a bit of cilantro and lime. The next day I had leftovers topped with onions and cheese. There's tons of flavor either way. You'll need a 6 to 7 quart slow cooker to make this recipe. 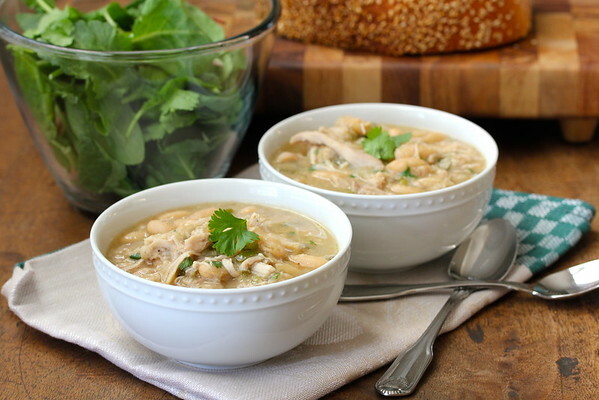 Adapted from Slow Cooker Revolution by America's Test Kitchen. In a blender, puree 2 cups of the broth and the hominy until smooth. Pour the mixture into a slow cooker. In a 12 inch skillet, heat the oil on medium heat until shimmering. Add the onion, jalapeños, garlic, cumin, and coriander and cook for about 10 minutes, until the onions are softened. Add the rest of the broth to deglaze the pan, scraping up any brown bits. Add the mixture to the slow cooker. Add the beans to the slow cooker. Season the chicken with salt and pepper and place the pieces into the slow cooker. Cover the slow cooker and cook on low for about 5 to 6 hours. Remove the chicken pieces from the slow cooker. Let sit for about 10 minutes. Remove the meat from the bones and shred the meat with forks. Skim any fat off of the surface of the chili in the slow cooker with a ladle. Add the shredded chicken meat back into the slow cooker. Add the pickled jalapeños and cilantro to the mixture. Add salt and pepper to taste, cover, and leave the cooker on warm until you are ready to serve. This looks and sounds amazing! Now, if I only had a slow cooker... or maybe I'll give it a try anyway. Bet you could make it in a Dutch oven in the oven at about 225. I love the bowls too =) Crate and Barrel. The pattern is called Staccato. Those few extra steps are always so worth it when cooking in the slow cooker! Right? Better than dump and run!